Wheelchair Clothing Chair Mate Universal Fit. 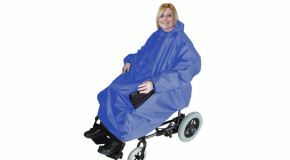 This type of wheelchair clothing has been designed to give maximum protection whilst offering unrestricted access to the controls. These can be located through Velcro sealed slots on either side of the cover, making it a universal fit for either right or left hand controls. The cover incorporates the storage pouch on the front, while the elasticated back fits over the back of the chair, to keep the rain off. The close fitting design keeps the cover away from the wheels. Available in one size.